August 6 and 9 are important dates in history, corresponding to the use of atom bombs in Hiroshima and Nagasaki Japan on those dates in the mid 1940s, respectively. The relevance of those historic military missions relates to drones in a direct way. That is, this history of unmanned aerial vehicles traces its origins to World War I and II, at least. 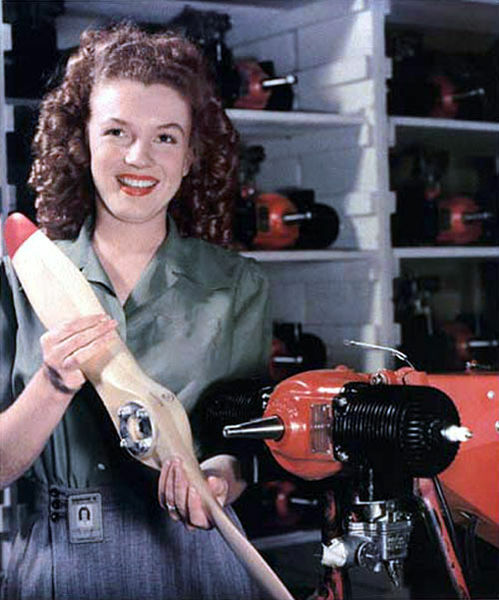 (Oh, right, the picture: Marilyn Monroe working as a technician at the Radioplane munitions factory in 1944.) In fact, the United States Navy began experimenting with radio controlled aircraft in the 1930s. Posted in UAV and tagged Atomic bombings of Hiroshima and Nagasaki, drones, Hiroshima, Japan, Marilyn Monroe, Nagasaki, Nuclear weapon, radioplane, Ravich, United States, United States Navy, Unmanned aerial vehicles, World War II on August 6, 2013 by Timothy M. Ravich.